This scribble was published on Friday, July 2nd, 2010. You can follow any banter on this scribble with the RSS 2.0 feed. You can leave a response, or trackback from your own site. 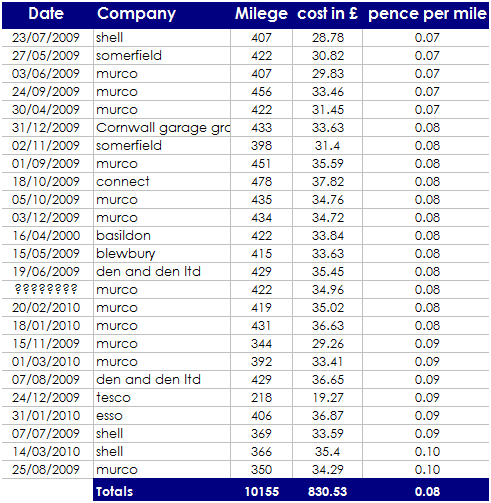 Excel forgot, interest and deprecation (in price) the two major costs of car. Daniel – please check the comment rule that cites irritating pedantry. This is annual costs after purchase, framed by outgoings and income within a year. There are not interest payments and depreciation acts on the purchase-price which only has a real impact on annual income if you plan to sell the car. Sorry, I will try to become more law-abiding citizen of the blog from now on.